In today’s world, a company can be situated anywhere in the world and have a broad reach. Ward Cedar Log Home is located in Houlton, ME, a small hometown community. It is an area rich in Cedar trees that we use in each and every home. From our manufacturing facility, we do not just ship homes across the U.S., log homes sail across the ocean from time to time as well. A few weeks ago, Ward shipped out one of the largest residential homes it has done, a 9,000 square foot log home package destined to the Dominican Republic. This isn’t the first log home shipped overseas. Ward Cedar Log Homes has shipped to Japan, Korea, Netherlands, Taiwan, Philippines, Nova Scotia, Germany, and many other countries. Although this isn’t the first home shipped to the Dominican, it was special. The home was designed for a current Major League baseball player that has requested to remain anonymous due to confidentiality. Ward is grateful to have the opportunity to work with the athlete and provide the log home of his dreams. Planning stages took 6 months to complete on the custom cedar home with several revisions until it was narrowed down to exactly what the client wanted. The log home mansion features six bedroom, six bathrooms, a movie theater, exercise room, game room, and a two lane bowling alley. It took five 40 foot shipping containers and arrived in the Dominican Republic in late September where it will be erected over the next few months. Here are a few artist renderings of what the home will look like. It’s not the first time Ward Cedar Log Homes has worked with a high profile client. Our Homes have been designed and built for the daughter of Art Linkletter, a conductor for the Boston Symphony, an editor of the National Geographic Magazine, and buildings for Princeton University. So no matter what your needs and wants are, Ward can bring them to reality. Whether it is a small cabin in the woods to a luxurious retreat or commercial buildings, the possibilities are endless. 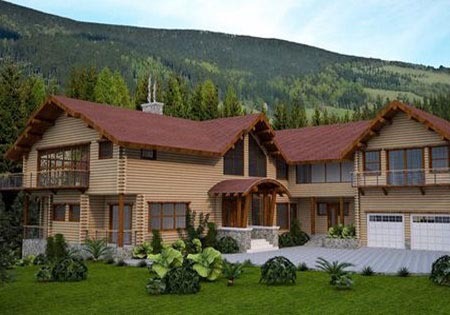 Ready to start planning your log home? Give us a call today at 800-341-1566 or drop us an email.